A student scholarship helps Able ARTS Work provide the best possible opportunities and services for people with developmental disabilities. By supporting our new Student Scholarship program, you make it possible for adult students with disabilities to access meaningful therapeutic services daily. Dollars raised directly support four critical areas of need that make up our life-changing services. As a supporter of the arts, you are an integral part of a community who believes in the power of the arts and its role in creating a healthy, vibrant community for all. For scholarships in memory of a loved one, we give tribute to the lasting memory of someone special. Your loved one made a difference. Their legacy will too. Therapy Classroom Needs – Our students respond best and learn the most from high quality experiences. Your support will help us provide high quality instruments and art-making materials for our Music and Art Therapists to use in the classroom with students. Community Engagement - students enjoy and welcome opportunities to visit museums, galleries and other community venues. Funds pay for gas, vehicle maintenance, entry fees and snacks. Technology for Student Accessibility – from Facebook to YouTube to Instagram and Podomatic, our students share their art and music on social media. Access to technology ensures our staff and students stay relevant and have the tools they need to execute their vision! 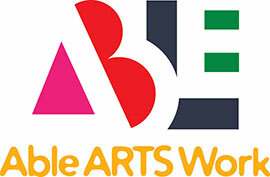 Student Support Fund – Able ARTS Work is committed to offering services to families that need help, but not all families have access to insurance or have the financial assistance they need to support their children. The Student Support Fund helps these families participate in our Creative Arts Therapy Clinic, Accessible Art Workshops and more. $125 provides one full day of evidence-based therapeutic services in our day programs for adult students with developmental disabilities. $2,500 provides one month of daily evidence-based therapeutic services in our day programs for adult students with developmental disabilities. $30,000 provides one year of daily evidence-based therapeutic services in our day programs for adult students with developmental disabilities. For more information, please contact Megan Christensen, Director of Development mchristensen@ableartswork.org or 562 982 0247.